This article is the first in our three-part series on the blinding, deafening and sometimes deadly conditions in Indigenous Australian children that have little to no impact on their non-Indigenous counterparts. The next two articles will look at rheumatic heart fever and disease; and otitis media. Many people don’t know this, but Indigenous Australian children are born with much better eyesight than non-Indigenous children. Yet, at the population level, Indigenous people at the age of 40 have rates of vision loss three times that of non-Indigenous Australians. Rates of blindness are six times higher among Indigenous adults. The prevalence of vision problems in Indigenous people is a result of cataracts, diabetic eye disease and a disease non-Indigenous children don’t get – trachoma. In fact, trachoma disappeared from mainstream Australia more than 100 years ago with improved hygiene facilities, water infrastructure and living conditions. Yet, in some areas, 4% of Indigenous children aged from five to nine years old have an active trachoma infection. In the Northern Territory, that rate is 5%, which is considered an endemic level. We used to call trachoma sandy blight (the eyes feel gritty, as if full of sand). It is the world’s leading cause of infectious blindness. Trachoma is caused by the bacterium Chlamydia trachomatis, which creates swelling under the inner eyelid leading to scarring. The scars cause the eyelashes to turn inward and scratch the eye, which is intensely painful and made worse by blinking. Eventually, if left untreated, all the scratching from the lashes will result in the cornea – the transparent layer at the front of the eye – going cloudy and the person having irreversible blindness. 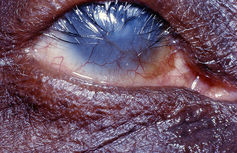 Trachoma leads to eyelashes turning inwards and scratching the eye, leading to blindness. Trachoma easily spreads from one child to another through infected eye and nose secretions. Unlike other infectious diseases, a single episode of trachoma is often not uncomfortable or noticed as being any different from just a runny nose. Nor is a single episode such a problem for the individual child. The main issue is that children keep getting reinfected, which keeps the inflammation present. A child may have between 30 and 40 episodes of reinfection during their childhood and around 160 to 180 infections until the resultant scarring causes blindness. Each episode of infection may last a few months, but repeated reinfection turns into a continuing infection and disease. The longer the inflammation goes on, the worse the discomfort and more severe the scarring. And the more severe the scarring the greater the risk of blindness. Australia remains the only high-income country to still have trachoma. 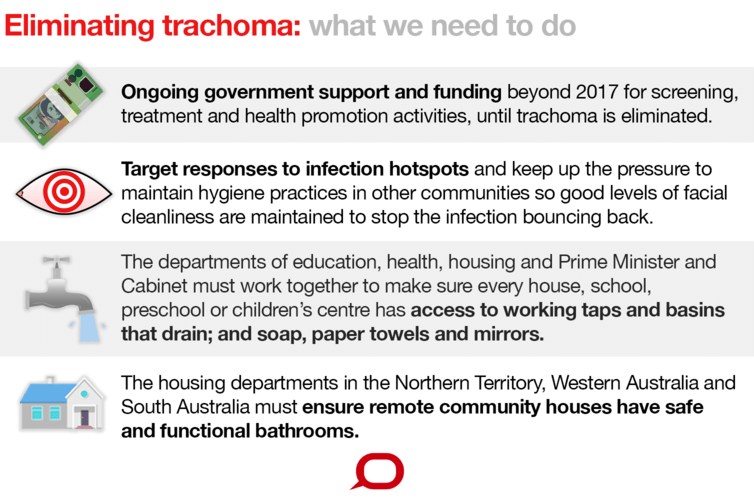 Although it doesn’t exist in mainstream Australia, trachoma persists in remote Aboriginal communities that still lack safe washing facilities and have notoriously poor and chronically overcrowded housing. Young children with constant eye and nose secretions in remote endemic communities sometimes go unnoticed and washing a child’s face whenever it’s dirty (with eye and nose secretions) is not common. But Australia is making progress. In 2009, the Australian government committed to eliminating trachoma by 2020. At that time, disease rates ranged between 15% and 20%. Data from 2015 show a massive drop, with the national average for children in endemic areas at 4.6%. Of equal importance is the dramatic reduction in the number of communities with trachoma. More than 150 of the 200 or so at-risk communities no longer have trachoma and there are only a small number with high rates. These hotpots are mainly in and around Central Australia. Globally, trachoma affects people in remote and rural communities with poor personal and community hygiene. In 2016, an estimated 200 million people are at risk of trachoma in 42 countries – mainly in sub-Saharan Africa, but also in countries such as Afghanistan, India, Brazil, Colombia and some Pacific Island nations. The World Health Organisation has set the goal of eliminating blinding trachoma by 2020. Countries such as Morocco, Ghana, Iran, Mexico, Nepal, China and Cambodia have eliminated trachoma over the last ten years. The World Health Organisation developed the SAFE strategy to eliminate trachoma. This includes: surgery to correct the inward eye lashes (S); antibiotics to reduce levels of infection (A); promotion of facial cleanliness to stop transmission (F); and environmental improvements in water and sanitation (E). In Australia, the antibiotic azithromycin is given every six to 12 months to all household members of someone with trachoma, or everybody in affected communities. This brings down the level of infection, but without stopping the possibility of transmission, trachoma will bounce back. This is why keeping every child’s face clean is so important. The essential and sustainable strategy of maintaining trachoma elimination comes down to having clean faces, which goes with access to safe and functional bathrooms and washing facilities. Milpa the Trachoma Goanna mascot features in the materials and is involved in community activities. Improved hygiene will also help reduce other common and very serious infections in remote Indigenous communities. There are currently effective health promotion activities in Australia such as “Clean Faces, Strong Eyes”. Bodies such as the Indigenous Eye Health group at the University of Melbourne continue to work closely with community groups to build on this work. 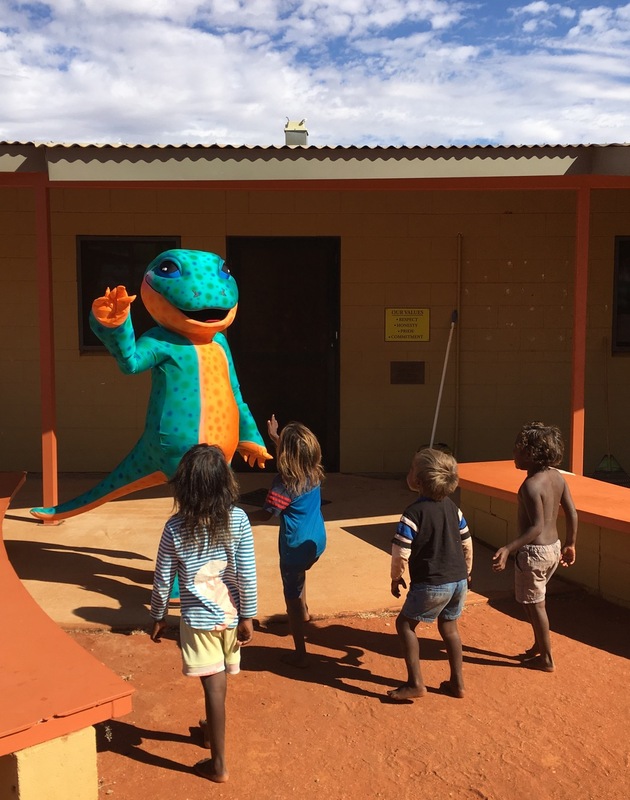 Milpa the Trachoma Goanna mascot features in educational materials and is involved in community activities, such as the development of music videos, roadshows and football clinics.